So after what felt like an extraordinarily long time away from blogland (really only a week), I am back. Where did I go, you might be wondering? Did I go somewhere lush and vacationy like Hawaii? Did I go run a marathon in some exciting venue? Did I land in the hospital after my kids came after me for dumping them in the gutter face first last week? 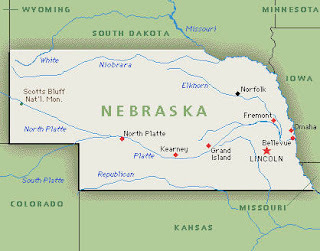 No, my bloggy friends, I went to Nebraska (insert snarky remark of your choice here). Anyway, after runinng my highest mileage training week to-date just two weeks ago, last week was an utter fail. I managed some shorter runs of 4-6 miles (which involved me quite literally dragging my dog behind me as she clung, paws-outstretched, toenail-deep, to the few shady spots in the 85-degree humidity of the Cornhusker state), but didn't manage to cram in a long run. I felt horribly guilty and quite cranky about this, but then decided to rationalize it by telling myself it was an intentional easier "rest" week built into my training. So that's where we sit. This week I'll do a 14 or 15-miler. I swear. Just as a good run often follows a bad one, the weather the last 3 days has been gorgeous in response to the cursed snow last week. I had 400 things to squeeze in today before leaving town tomorrow morning, and at the end of that list was running. Not because I didn't want to do it, just because the 399 things before it were all stupid, time-consuming things I didn't want to do but had to pressing issues that must be dealt with today. (Or so they kept yelling in my face.) ANYWAY, I got a free timeslot when Shortie1's rescheduled soccer game got cancelled, due to...mud. (Mud? Really? Whatever.) And just like that, a run was in. Because the weather was outstanding and both hubs and I wanted to take advantage of it, and because we only planned to do a short loop around the neighborhood, we decided to attempt the double stroller. It is important to understand that the stroller plus Shorties probably weighs 100 pounds (they are technically probably too big to be in there, but we're risk takers like that) so this decision is not taken lightly--it was that nice out. Mile 9 I started to lose a little steam, so I had half the bag of Sharkies I brought with me. They did help, but then I finished off my water shortly thereafter and wished I'd brought more, seeing as the last 3 miles of the run was primarily uphill to get back home, and the sun was hot. But I pressed on, took a couple of 20-second walkbreaks, and made it. My legs were definitely more tired and sore than with the trail runs...and I really, really wished I could just lay on the couch for the rest of the evening. However, the kids needed to be fed, and hubs also did a long 14 mile run, so he was in no shape to be of much help. It was an early bedtime night for all of us. It was an exciting race to watch and I was really, really wishing Kara G. would pull it out and get that win. She was still fun to watch race, though. Congrats to all of the Boston runners: can't wait to read your race reports! 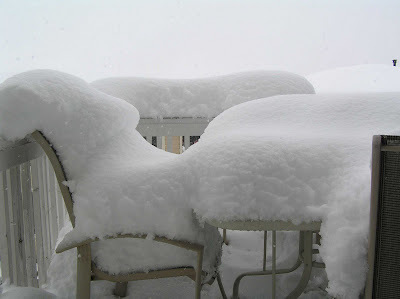 This is the snow that has accumulated in my backyard as of 3:00 today. It's more than 14 inches and I think it's more like 20 inches so far (insert appropriate "20-inch" double entendre here)--that taller snow on the back of the table is the full amount, as we scooped off a section of it yesterday at 3:00 to see how much more we got today. I had hoped to do a long run today of 12-14 miles, but I have to say that though I may be loco enough to do 70 laps indoors, I refuse to go upwards of 100. So I decided to do a shorter easy run today, with the sincere hope that the big ol' hot mountain sun will come out tomorrow and melt all this wet nastiness to where I can at least traverse the sidewalks. The one chink in that plan is that is was supposed to stop snowing at noon today; it is now 3:30 and still snowing. Hmmm...that better be some sun tomorrow. Item 1: Due to the recurring snow phenomenon, I was forced indoors last night for my 7 mile run. Now those of you who tolerate, nevermind enjoy, the cursed treadmill probably are saying, "well that's not as nice as outside, but hey the treadmill isn't so bad, and that's not such a long run..."
The nice thing about running on the track is that I tend to run faster because 1) it's completely flat, yo and 2) I just want to get the hell done and have all the people working out and lifting weights stop staring at me like I 'm a crazy person because yes, after 45 minutes, I am STILL THERE RUNNING AROUND THAT DAMN LITTLE TRACK. So last nights run stats: 7 miles in 1:07...which interestingly, is only a minute longer than it took me to complete my 10k last weekend. Sigh. If only every race were flat. Item two is the 14-22 inches of snow they are saying we will get throughout today and tomorrow morning. IT'S F-IN APRIL: SNOW YOU GET A FAIL FOR MISSING WINTER COMPLETELY. If we do indeed get that snow, I will post some fun buried-dog-and-shorties shots. Stay tuned. God, I think I love her! Almost as much as Alex and her clearly-gay husband Simon!! She has been likened to a giraffe (I agree, though I always thought of her as a yippy, whiny, annoying little chihuaha--maybe Jill''s little Ginger!--but the giraffe metaphor works)...so I think I'll consider this a "wildlife encounter" as well. Happy Friday! Well, in response to today's Runner's Lounge Take It and Run Thursday, I will attempt to share my tips for how I use my blog to help my running, how/why I started, what keeps me blogging and how I use it to keep me running. As I said in my blogland-deflowering first post, I have been a runner for quite a long time: 15 years or so. At times, I ran more, at times less...sometimes faster, sometimes slower...sometimes I raced, sometimes I simply ran to get the stressballs out of my shoulders and minimize the liklihood that I would maim a coworker or wind up on the evening news after a fit of road rage. I ran to make it through pregnancy intact; I ran to get back to being "me" post-pregnancy. I ran to go on non-date dates with my not-yet husband. I ran to explore places I traveled. I ran to get some time by myself. I ran to think. I ran to escape. I ran to eat chocolate and pizza and drink wine whenever I liked, without physical repurcussion and cellulite. So, when I decided this year (pushed over the edge by the very funny and inspiring bloggers I followed) to finally commit to running my first-ever half marathon and marathon, I knew I would need something more than just my own self and my spotty self-shame and derivation to keep me accountable. I'd been enjoying (lurking) others' running-and-life-related blogs for a while...and I knew that it was just the medium I needed to spew all the stuff that the hubs and non-running friends were tired of hearing me pontificate about (what do you mean when you say that you have no idea what the best training plan for a marathon is and you don't care to ever find out? When you say "running and talking about running makes you want to kill yourself" exactly what context do you mean that in?). I needed people that could actually provide guidance and resources and occasionally answers to questions...I needed an audience (real or imagined) of my own peeps. No, not that kind of peeps. I use my blog to track my runs (easier than my old log notebook, which I seem to forget, lose quite often, and hey I sit in front of a computer all day anyway and I don't even know how to make plans without an electronic calendar appointment so blogging seems pretty ideal for me) and keep myself motivated. Imagining others are following my progress keeps me accountable and reading others stories keeps me excited. It is also nice to have a "free" space to spew any other garbage that comes into my head, running related or not. Plus, if you really know me, you'll see that I have quite an affection for running, and blogging about it justifies the whole relationship. My advice to anyone considering starting a blog? Go for it. Blogging is easy and free, and if you have self-control and common sense, you'll only spend about 15 minutes a day on it. Of course if you have neither of those, you'll become like the rest of us (see blogs I follow, at right)....but you'll be in good company! If only they weren't $50. That's $25 per itty bitty booby. I'm not sure my itty bitties are worth that much apiece...but as a sufferer of the maladies outlined in Ms. Wexler's post, I am inclined to give these a try. If so, I will do a fitting review for those of you who are, ahem, also itty bitty (which, BTW, doesn't that almost make being flat sound cute, instead of demeaning?) though I won't promise any pics...unless the folks at itty bitty want to send me a free one. That might be worthy of a pic (yes, I am easily bought out...and anyway, no one wants to look at itty bitty boobies so I'll be safe). And with that I say, "You're welcome Glaven." You're the first thing I think about when I wake up in the morning: when will I get to see you today? Can I sneak away pre-dawn for a decadent rendezvous? Will we have a lunchtime tryst? Maybe I can leave work early and sneak away for a pleasurable hour together, before going home to my family, where I'll pretend not to think of you...or perhaps I'll throw caution and good sense (knowing I'll never be able to get to bed at a reasonable hour) to the wind and find a way to meet you after the kids are in bed for a late night assignation. After our sweaty frolic, I'll lie awake in bed remembering every lap together. When I finally sleep, I'll find you in my dreams where I'll sail on gilded wings, winning every race and feeling light as air. I'll wake up, heart racing, exquisite rapture pulsing through my veins, lusting to lose myself in you again. Oh lover, I see you everywhere! I think about you when sitting at my desk. I ought to be working, but all I can do is stare out my window and fantasize about your naked, rugged, sweaty goodness. I dream of you and what you'll do to my legs, chest, and tush. I wonder when you will next caress my body, and how long it will last....one hour? Or can I somehow steal two and fully enjoy your glory? I wonder what delicious pain and joy you have in store for me. I guiltily skulk around the internet, looking for traces of you. I google your name, I hunt down places where you might hang out, I sneakily read others stories and thoughts about you. I can't get you out of my mind! Your likeness is branded on my heart...you have become entwined with my soul! How did I ever live without you?! No one understands me like you! You must promise never to leave me! I'll simply die without you!!!! Deep down I know that if anyone knew how much I loved you and how I thought about you, they would think me mad. I need you! I must have you! I can't live without you! I cannot take another day without you! I need to feel you on my body....I swear, I don't care about Off Day or Cross Training--they mean nothing to me! I need to see you today! Please say you'll meet me this afternoon! 4:00, in the usual spot at Wash Park. I'll be there, looking for you my lover, Running. Please don't deny me!!!! I don’t care who sees us! Running, I love you!!! 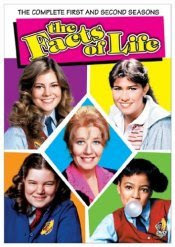 the facts of [running] life..."
Holy bejezus, that Mindy Cohn could act. And then, in answer to my resounding defeat on Saturday, I did my long run yesterday at one of my favorite spots, the Highline Canal Trail, and completed my longest run to-date: 12 miles. It was still cold and damp, and rainy for part of it, but somehow, it felt great out and seeing all the other crazy people out there running, too, justifed me doing it. I think that is one of the things I love most about Colorado--no matter what the weather, you'll see some loon out running in it. And probably in shorts. Anyway, I managed to keep a very consistent pace of 9:30-9:45 and then picked it up the last two miles to 8:45-9:00. No walking, finished strong, felt great, and am not too sore today. By my house, there is a massive, massive hill on the trail system. After Shortie2 was born, conquering this hill was my now-I-know-I'm-back-in-shape milestone. I spent a lot of time running and getting fit enough to run up this monster. Once I could do so, I promptly avoided it on my runs, unless I was going in the downhill direction. Well, that hill is the start--the start--of the 10K I am doing this weekend (seriously these HRCA race organizers are total masochists). So, the past two weeks, I have gotten reacquainted with the uphill side, most recently on my long run last week. It's still tough, but now that I'm running more and actually training, as opposed to just running so that I can eat chocolate every day without gaining weight, it did seem a little bit easier than I remembered. Last night my running group met at the base of the Hill, in order to do some hill intervals. I have been dreading it since snow cancelled the originally scheduled session last week. The workout was to do 6 reps of 90 seconds up, followed with 90 seconds of walking/jogging. We were split into our A-B-C "ability" groups and took off. We made it up, came back down, and when our Fearless Leader asked if anyone was up for a couple more reps, everyone willingly jumped right in. Astonishing! Alone, I probably would have called it good....but with the support of the group and all those other people willing to run it again, it was actually...ok. Peer pressure is a beautiful thing. 1 - Drop off Shortie1 at soccer practice. 2 - Drive home, get double stoller, install Shortie2, run back to Shortie1's soccer practice. 3 - Pick up Shortie1, install in stroller, run home with both and arrive in time to cook dinner for all. 1 - Drop of Shortie1 a soccer practice, 10 minutes late because of traffic and slowness at daycare. 2 - Drive home, find double stroller up on hook waaaayyyy high in the garage as hubs forgot to get it down before going on his run. Waste 10 minutes getting ladder out in order to retrieve stroller. Nearly drop stroller on Shortie2, who asks "You got it mom? You got stroller? Not drop it?" 3 - Another 10 minutes making 4 return trips inside for: milk (Shortie2), snack (both Shorties), potty break (me and Shortie2), water (me). 4 - Finally set off, 35 minutes behind schedule...20 minutes and 3 miles to get to practice. Psych self up, "Ok, we can do this! Go!" 5 - Sinking realization that Shortie2 is considerably bigger than last time I ran with stroller...or I have lost stroller arms...or both. Begin worry that I won't make it to practice in time. 6 - Coincidentally meet hubs on the back side of his out-and-back run. Convince him to join us (and take over stroller duty). Feel mildly guilty as he has already run 10 miles. But not guilty enough to keep stroller. 7 - Almost there, leave hubs with stroller, allowing him to walk so I can sprint and get to practice field in time, so Shortie1 is not left wondering where mommy is. Panic, recalling in head conversation on way to practice in which Shortie1 says, "but what if you aren't there when my practice is over?" in response to hearing my great plan, and me pinky swearing, "Mommy will be there Shortie, don't you worry. I will have a watch and I will make SURE I am there in time." All-out sprinting now to make it there in the next 2 minutes. 8 - Arrive just barely on time, decide to let Shorties play at playground while hubs rests a few minutes before the return 3 miles home. Uphill. With extra 55 pounds of Shortie2. Did I mention uphill? 9 - Walk-jog home with hubs glaring and griping. Slight guilt that I convinced him to join me (that was not in the plan). Shorties whining that they are huuuunnnnnggrrrrryyyy moooommmmyyyy. 10 - Arrive home 30 minutes later than planned, too late to cook, everyone tired and hungry and unhappy with mom's plan. Rush trip to Subway. 11 - Apply for Mother of the Year Award. Again. Last week when things were slow and I had time, I got all fancy with actual thoughts, pictures and links and crap. Well, now I'm busy so it is just boring old run stats. 4)did I mention no snow?! *This required that I walk 8 blocks to get lunch...unfortunately I chose to wear 3" heels and a dress today and the feet simply would have no part of it. The only solution was to put on my running shoes with my dress for the walk. Yes, ladies and gentlemen, today I became That Girl who wears sneakers with dresses. Actually I should probably say That Lady, because I am not sure I still qualify for the girl category anymore, at my age. My pride is gone, but at least I Saved The Feet for my long run today. And I hope I don't end up on the Glamour.com Don'ts page. 1- After joking about it yesterday, I actually saw a coyote ahead of me on the trail today. I froze and racked my brain trying to remember what the display at our neighborhood rec center said to do if you came across a coyote on the trails....and...blank. Nothing. Complete brain fart. In lieu of doing whatever the "right" thing is, I just froze and waited. He did eventually skulk away and in retrospect, I am just really glad it wasn't a mountain lion instead. Perhaps I should stop joking about that...and read the helpful signs posted on the trail about what to do when you encounter wildlife. 2 - A bug flew into my mouth. As soon as I saw it near my head, I thought "wouldn't that be so gross if it actually flew into my mouth?" and then it did. And I tried to spit is right back out, But I am fairly confident it got lodged in my gum in the process and I felt a crunch when I chewed. So then I had to spit my gum out. And I hate running without gum. 4 - My garmin told me I burned 1200 calories. This seems like a lot....I was wearing my heart rate monitor and I do have it programmed for my age/gender/weight. I am still not sure I believe it, though. 1200 seems excessive...maybe it was all those effing uphills??? Or the coyote scare? Does fear make you burn more calories? Today I may do a mile or two to loosen/warm up before my weights/core work. Or I may not...haven't decided yet. The snow and blustery cold (it's APRIL for fu(k's sake!) have made me sluggish. I love free. Whatever it is, if it is free, I love it. I call the hubbs Bargain Boy, because he genetically inherited the trait to love anything--and I DO MEAN ANYTHING--that is a bargain (Big Donny that's your legacy, thanks a lot) but I suppose I am woman (and cheap) enough to admit that I just love free. To witness: just last weekend, we were heading out of town from our Nebraska "holiday" and I saw a handmade sign on the curb that said FREE. Sitting beside it was a lot of worthless crap, but also sitting beside it was 4 rough but rather splendid dining chairs. Oddly, two were painted black and two were white but both sets had lovely matching Country Mauve fabric-covered cushions. ANYWAY, I quick got on the phone and called it in to my mother-in-law who was working on decorating a table for this little shindig and I thought the two white chairs might be just what she needed for her all white setup (with cushion recovering of course). Plus, they were FREE. I hope she went and grabbed them. But I digress...the real reason for this post about freeness is not just to disguise the fact that I skipped running yesterday simply due to snow-induced laziness, but because I want some free stuff from onlineshoes.com, and the easiest way to get it is to win one of the awesome totally lame, don't go there and enter cause you won't win anyway, forget I mentioned it in the first place giveaways these two bloggy chicks are hosting. So in the interest of scoring additional entries, and because her blog is a good read, I am mentioning Chic Runner and her coolio giveaway. Also because I aim to be fair and her blog is also a good and laughter-inducing read, I will mention by name Marcy at I Signed Up for This. But whatever you do, DON'T enter her very cool super lame onlineshoes.com giveaway and minimize my chances. Buena suerte and bon chance, entrants! running scared from me out on the Colorado trails. So either to your dismay (Xcountry2) or your delight (carpeviam) the devil's food funfetti cake was destroyed yesterday by Shortie2, who felt compelled to run grubby little fingers all over the top of the cake and grab fistfuls to shovel into similarly grubby little mouth. Bye bye funfetti cake; oh how I'll miss you! However, I discovered that the funfetti frosting...is, uh, not so good for you. Not that I thought it would be one of the world's healthiest foods (which, speaking of--Mr. George Mateljan? A little waxy looking......like perhaps all those worldly healthy foods have preserved him WELLLLL beyond his Best Before date....but maybe it's just me that thinks that), but a little healthy frosting denial never hurt anyone, did it? Did it?! Though, someone please tell me this--how is it that there is "0% Trans Fat" in said funfetti frosting, yet the second ingredient in the delightfully creamy funfetti is "partially hydrogenated vegetable oil." ??? So I guess it's one of those products where if the amount per serving is below a certain threshold, then they can magically claim 0, even though funfetti frosting is clearly made of whipped trans fat. Sneaky Pillsbury, very sneaky. I'm not sure I like those tactics. It might even warrant a change from funfetti to something more healthy like this for me next year. But don't hold me to that. Funfetti is pretty good. Also, WTF is up with their little disclaimer thinger, there? What exactly is going on at this website, Pillsbury? Are you advocating using your funfetti frosting for some risque activities? Well, just to be safe, I'll be sure to keep my Shorties away from your filthy funfetti frosting website in the future. Wednesday 4/1 - Supposed to do 45-min hills workout with the running group, however it is thunder snowing. So today probably a day off instead. And finally, one gratuitous unrelated link from my 'personal links' folder in my Favorites...just for the helluvit cause I'm bored and having fun with links today.